When the main floor of the museum’s historic 1916 building reopened last summer, visitors experienced galleries that had been renovated to their original grandeur, with a sense of light and space that restored the vision of the architects Hubbell & Benes. This June, with the opening of the main floor of Rafael Viñoly’s new east wing, we get the first real taste of what the new museum will be like. Within the distinctive zigzag exterior footprint, the more than 27,000 square feet of galleries present striking new spaces arranged along a perfectly aligned sequence of doorways that establishes a clear sight line all the way from the contemporary collections to the dramatic glass cube at the southern end of the addition. 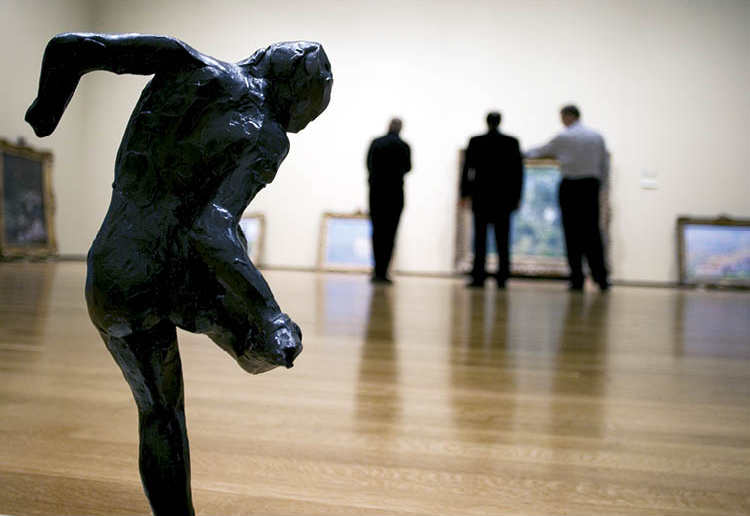 One of the stated goals of the expansion project was to create a new sense of openness and connection to the neighborhood, and nothing expresses that goal more powerfully than when a pedestrian strolling along East Boulevard glances up to marvel at Rodin’s The Age of Bronze and a dozen other sculptural masterworks displayed in the glass room for any bypasser to see. Similarly, the impression from within these new rooms is one of connection to the surrounding landscape, as natural light illuminates circulation spaces and some galleries, and windows look out to the street. 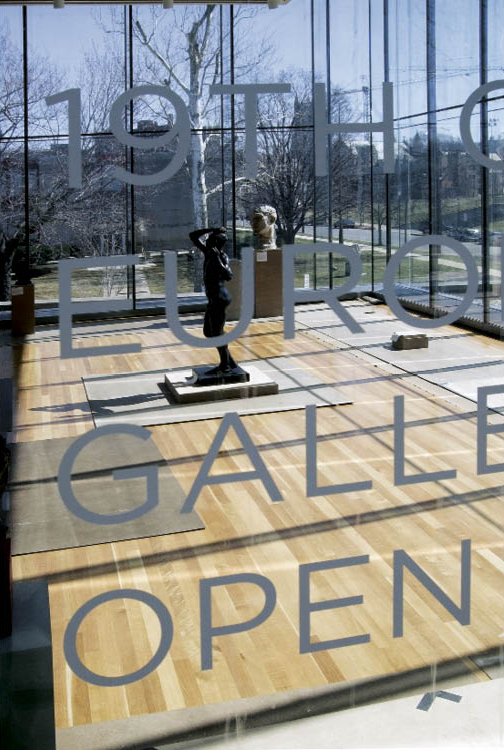 The collections contained in the east wing include some of the museum’s most famous and beloved works of art, picking up the thread of European art where it leaves off in the early 1800s in the south building and continuing that evolution through Impressionism, post-Impressionism, and modern and contemporary art. Corot, Bougereau, Manet, Degas, Rodin, Renoir, Monet, Matisse, Picasso, Braque, Modigliani, and many others lead up to contemporary art and the likes of Chuck Close and Louise Bourgeois. American art also picks up its thread, from the early 20th century and up to the present day, from Georgia O’Keeffe through Andy Warhol and Sol LeWitt. Three separate spaces are devoted to decorative arts. Cleveland art is also highlighted. Also in the northern end of the wing with the contemporary collections are the museum’s first dedicated spaces devoted to rotations of photography. The first rotation—the schedule will typically offer three rotations per year—is titled Portraits: American Photography 1960–Present, featuring about 40 works from the museum’s photography collection, enriched by six loans from a private collection. The arrangement of spaces allows visitors who wish to do so to follow a chronological path starting at the northern end of the east wing with art of the present day and moving back in time while walking to the south. At the southern end of the east wing, visitors then pass through the glass walkway into the 1916 south building, where the chronology continues. But one of the spatial innovations of Viñoly’s plan is that visitors can also drop into individual galleries from the “allée” skirting the edge of the east wing and are not forced into a single path. 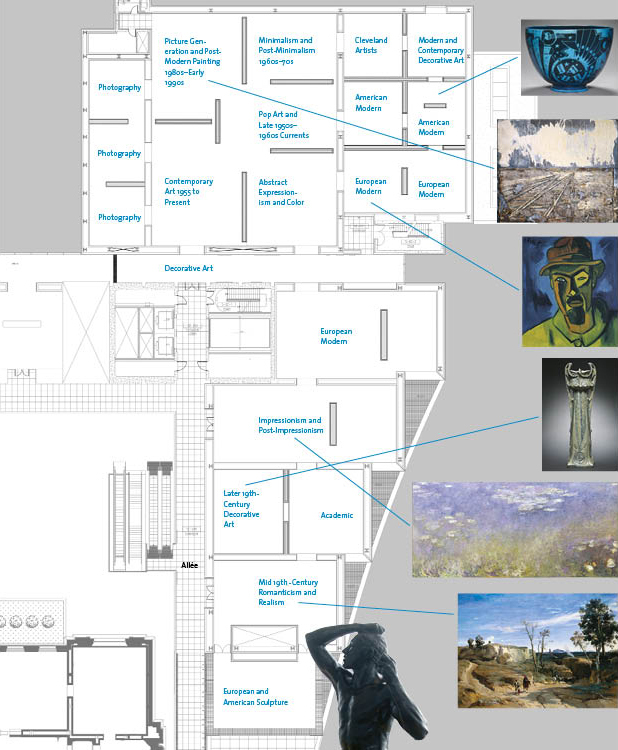 With the opening of the west wing (designed essentially as a mirror image of the southern portion of the east wing) and the central atrium, visitors will have many options to move through the collections thematically, chronologically—even randomly—according to their own preferences. The great open space at the center, along with the many windows offering a glimpse outside or into other spaces within the museum, will ensure that, no matter where a visitor may be, the path will be clear and intuitive.